Ed and Jean returned from a year in New York City and Union Seminary in the fall of 1969. Ed was turning 40 years old. He had expected to return to his job as Assistant Chaplain, but with the retirement of L.H. Hollingsworth, he was offered the job as University Chaplain, a position he would hold for the next 34 years. This was a dynamic time in the country and also on the Wake Forest campus. Students were focused on political actions, with the Vietnam War at the center of attention. The campus was becoming more attuned with the larger world, both politically and culturally. The Wake Forest Student Union, formed with the move to the Reynolda campus, hosted a large number of activities, including an extensive movie series, a lecture series focusing on current events, a performing artist series, recreation programs, and many others. It was also an unsettled time. Consider the list of topics in the Contemporary Issues Series 1968-1969, five one-day symposia for ministers and laymen held across the state: Exploitation of Problems of Draft Counseling; A Case Study in Student Activism; Political Issues; Drugs: Marijuana and LSD; Violence: An American Heritage? 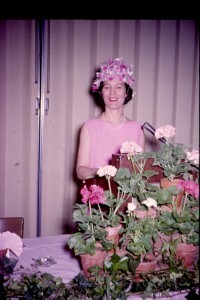 Jean and Ed followed political events together, but Jean also had her own role on the campus, involving in a range of groups including the University Club. She helped build a network of faculty wives and families to work on a variety of activities. When Ed found out he was to be promoted to University Chaplain, he recruited fellow Union Seminary student Richard McBride to become Assistant Chaplain. This partnership lasted ten years, until Richard went to Gardner-Webb and later to Elon University. In the early 1970s, the Wake Forest Campus Ministry group was made up of Ed and Richard, plus Bill Kercheval, Presbyterian chaplain; Mark Rose Jr, Methodist chaplain; and Jake Viverette, Episcopal chaplain. Bill, Mark, and Jake also served students at Salem College and Winston-Salem State University. These chaplains created a rich collaboration for the next seven years and shaped campus ministry for years to come. The group was supported by a group of Winston-Salem pastors who were in effect adjunct chaplains for students: Reverend Warren Carr, pastor of the Wake Forest Baptist Church, and Fr. Mike Begley, Reverend George Keck, Reverend Walter Roe, Father Richard Holleman, Dr. Charles Richman, and Rabbi David Rose. Campus Ministry in the early 1970s: Warren Carr (WFBC pastor), Miriam Ann Glover (intern), Bill Kercheval, Mark Rose, Jack Viverette, Richard McBride, and Ed Christman. 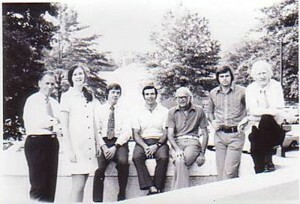 Campus Ministry in the 1970s offered personal support to students and also others in the university community. The chaplains planned and coordinated religious services and organized a wide variety of events that spoke to religion in a broader sense. They visited students in the infirmary or hospital. Students had an open door at the campus ministry office, which was in the library. 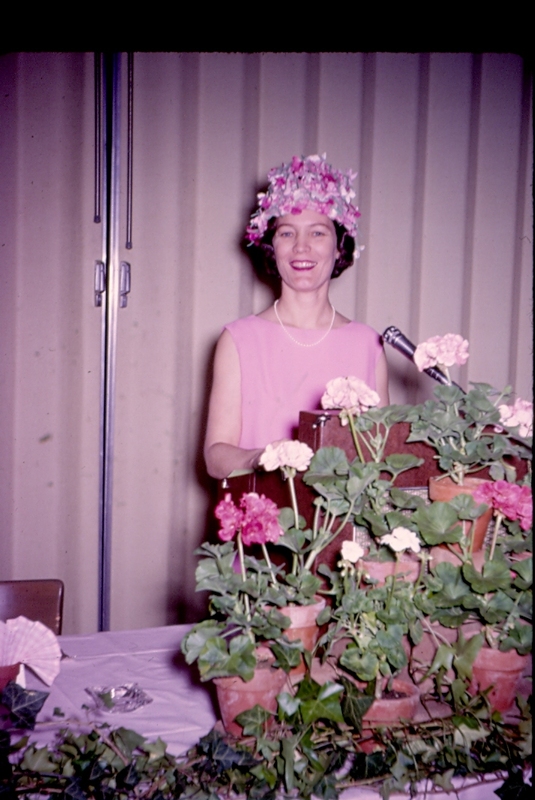 Weekly Chapel: In January 1969, weekly chapel became voluntary, not mandatory. During the following school year, Ed and the other campus ministers were experimenting with what to provide as a voluntary worship and religious expression for students. These services and sometimes presentations were held on Tuesdays, moving later to Thursdays. Services were usually held in Davis Chapel and might include scripture, a sermon or speech, hymns, and contemporary music. During the first year of voluntary chapel, topics included Christian Celebrations by Ed Christman; the Population Crisis discussed by Biology Professor Peter Weigl; arts programs; a Roman Catholic discussion of the liturgies including singing; and a presentation by the Covenant House Community students. Preschool Retreat at Camp Hanes: This conference, held the week before school, invited freshman to join chaplains, faculty, and returning students to welcome the new school year. The goal for students, faculty, and staff to explore the news and religious issues of the times, to celebrate a whole breadth of learning, and to build community for the year to come. All of this was made easier off-site in the beautiful surroundings of Camp Hanes. “The Attic” Coffee House: The Attic was actually the 8th floor of the library, a cozy space with a walk-out onto the roof of the building. A coffee house had been begun in 1966 but now gained a higher profile. The coffee house served coffee, Russian tea (made with Tang, the drink of the astronauts), sugar cake, ice cream, crackers, music, checkers, chess, and serious or not-so-serious conversation. The Attic was open 7:30pm-11pm Monday through Thursday and 7:30 until midnight on Friday, Saturday, and Sunday. It was staffed primarily by campus ministers. New York Seminar: Ed and Jake both led an annual trip to New York City, for play-going, sightseeing, visiting museums, and other “exotic places.” Visits were also planned to meet Wake Forest alumni who were ministers in the city, to visit innovative ministries, and learn about ministry in this urban environment. Each seminar had a theme, such as the 1969 title of American Foreign Policy and Developing Nations. Volunteer Service Projects: Campus Ministry made connections between community service agencies, such as the YMCA and the Experiment in Self-Reliance, and students interested in volunteering in Winston-Salem. Colloquim: This series of six dinner meetings during the school year brought together faculty and students from Wake Forest, Salem, and Winston-Salem State to discuss current issues in higher education. The Covenant House: another project of the Winston-Salem Campus Ministry group began in 1968 as a home for the city’s college students, including Wake Foresters, to live in the West End neighborhood in downtown Winston-Salem. The students provided a breakfast club, recreation program, coffee house for teenagers, tutoring, visitation of the elderly, a kids’ club, and draft counseling for young men. All this while students were still academically responsible! d was an adviser for the project. In the early 1970s, students were focused on world events — and how these events connected to what was happening in Winston-Salem. As Richard McBride remembered, there was a focus on policy at all levels — what was right, what should be done to make the world better — through the use of political strategies which including protest. This is in contrast to the focus of most of today’s students, who seem to focus on service orientation rather than into policy change. The War: The Vietnam War had begun one step at a time, but by 1965, American combat troops were involved. From the late 1960s into the early 1970s, this was the most significant political issue in the United States. Students were motivated by their beliefs and also by the reality of the draft. Political activity about the war energized other issues as well, including civil rights and the rights of women. In the spring of 1970, President Nixon openly expanded the war into Cambodia, and protests erupted nationwide. On May 4, 1970, during a student protest at Kent State University, National Guardsmen fired into a crowd, killing four students. Wake Forest students held a silent vigil, and President Scales offered a moratorium on classes the next day. On May 19, two weeks later, an estimated 600 students rallied on the campus and marched to President Scales’ house, located between the campus and Reynolda Road [today’s admissions building]. According to the May 22 story in the Old Gold and Black, senior Kirk Fuller, the march leader, listed these demands: abolition of ROTC, abolition of war-related contracts, establishment of day-care centers for Wake Forest employees, and open denunciation of the Indo-China war, disarming the campus police, and an end to employment discrimination in the cafeteria. Some students also proposed a boycott of classes and exams. President Scales met with the group outside of his house and then with the leaders inside. While he supported their anti-war position, he would not cancel classes or exams. The students then debated going to the intersection to block Reynolda Road. Then-Assistant Chaplain Richard McBride remembered standing on the porch of the President’s house and suggested that the students needed to go back to campus and rally other students and find a different response. Flanders Field: After the protest, campus ministers came up with idea of creating a ‘Flanders Field’ memorial on the Wake Forest campus to honor the NC soldiers who had been killed in the war. Using The Congressional Record — in which the names of the dead and their hometowns were recorded — students made a list of the 1,100 names. The names were written onto 1,100 wooden crosses. The crosses were put along the entrance road to the campus, with a sign explaining that these were only the North Carolina residents who had been killed in the war. This unique memorial made the news, and one night soon after, all of the crosses were stolen. A tip from a university employee to Ed located them in the parking lot of a church in Yadkin county, from which they were retrieved in Mark Rose’s van. The Flanders Field was soon re-installed in the open field next to the student apartments, at the corner of Polo Road and Faculty Drive [now Allan Easley Drive]. In this open green space, the memorial had greater dramatic presence. Jean putting flowers onto the “Flanders Field” memorial with a tired daughter ready to go home. The group requested a donation of roses, one for each cross, from the Winston-Salem Garden Club. The Club declined because they did not want to take a stand on the war. Instead, an individual donated the roses, and some roses were also clipped surreptitiously from the fence along the Cherry-Marshall expressway. Each cross received a rose. 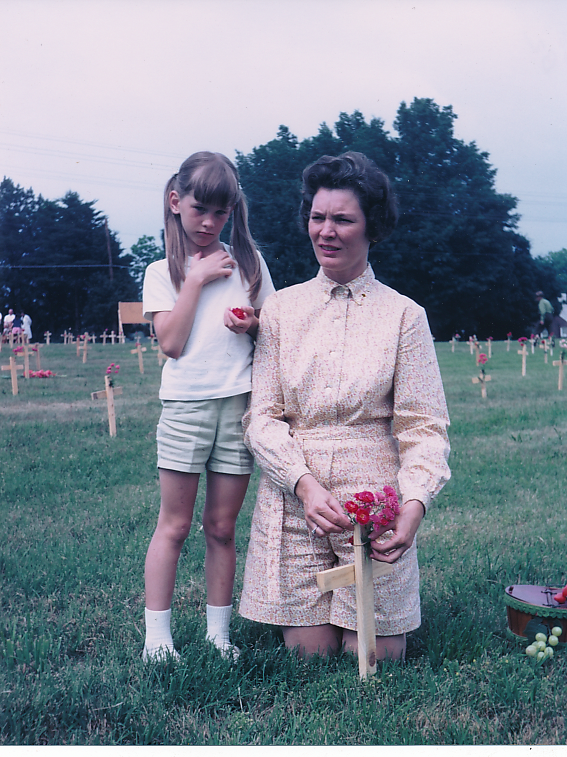 Crosses were lined up alphabetically in rows, with a map show the location of each cross so that families could easily find the cross for their loved ones. Family members came and brought flowers and prayers. Some students opposed the memorial; one brought gasoline and matches planning to burn the crosses but was intercepted and stopped. Afterward, the Field was then guarded 24 hours a day by campus ministers and students. Other protests were minimal though there remained some wariness among the chaplains. Ed’s most lasting memory was the arrival of an imposing man of military bearing. Silently, the man got out of his car and walked the rows until he found the cross he was looking for. He stayed for a few minutes and then departed, still in silence. Ed said later, “I didn’t know what our intentions were when the field was put up, but at that moment, I knew why it had been done.” The Field was installed for about a week. After that, with the semester coming to an end, the memorial was taken down. A worship service was held and the crosses were burned. Ed brought his own experiences as a chaplain forward and questioned the established church and its leaders on the Vietnam War. For Baptists in this South, establishment meant Billy Graham. Race: In addition to the war, issues of race also remained central. At Wake Forest, desegregation had occurred ten years earlier, but integration was stalled. During that decade, only a handful of black students had graduated. Edward Reynolds had returned to the campus to teach summer school courses in 1970, but it was not until 1974 when Wake Forest had its first full-time black faculty members: Herman Eure in Biology and Dolly McPherson in English, both of whom would have influential careers on the campus. Segregation in the Baptist denomination remained quite obvious. The state Baptist Convention was comprised of only white churches, with the General Baptist Convention serving black Baptist churches. In November 1970, BSU members from several white colleges, including Wake Forest, held a joint session with BSU members from traditionally black schools including A&T, Fayetteville State, Shaw, and North Carolina Central. They discussed the need to bring their concerns for action forward, putting pressure on pastors, church congregations, and community leaders to improve race relations. Leaders of this effort, including Penny Smallwood of Appalachian State University and David Waugh of Wake Forest, then attended the State Baptist Convention with resolutions, including requests for a joint session of the Convention with the General Baptist Convention, and the request for monetary aid for pastors who are dismissed by their churches for speaking out about injustice. 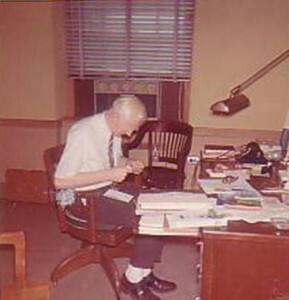 David Waugh later became pastor at Metro Baptist Church in New York City. Metro Baptist was and is “a progressive congregation with a vibrant social justice agenda,” and Ed frequently visited the church when taking students to the Big Apple. On a side note, Old Town Country Club in Winston-Salem, striving to remain segregated, issued a ban of all Wake Forest personnel except for the golf team. Presumably they lacked the imagination to realize that the future would bring golfers such as Tiger Woods. Jean was always a liberated woman, and Ed always recognized that. Their marriage was a model of partnership. 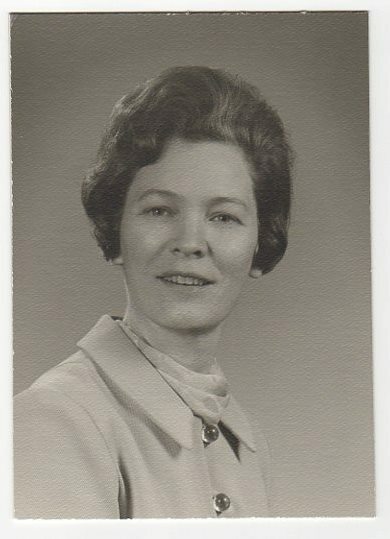 Photo by McNabb Studios, early 1970s. Media: It wasn’t just the message, either. Assistant Chaplain Richard McBride was an early innovator in the use of media, and he created religious programs using slide shows set to music that would teach and preach on a variety of topics. For example, he produced a multi-media Easter program in the mid-1970s where the images were projected onto a parachute, with Jesus Christ superstar music, which was performed at Reynolda House. “One Easter Sunday in the mid-1970s, we had awoken to see that a vile message regarding Dean of Women Lu Leake had been painted on the top of the Wake Forest water tower. After church, Richard [McBride] and I knew we had to do something.